Lambing (when the ewes (aka mamas) are having their babies) is always a fun and exciting season, albeit exhausting too. 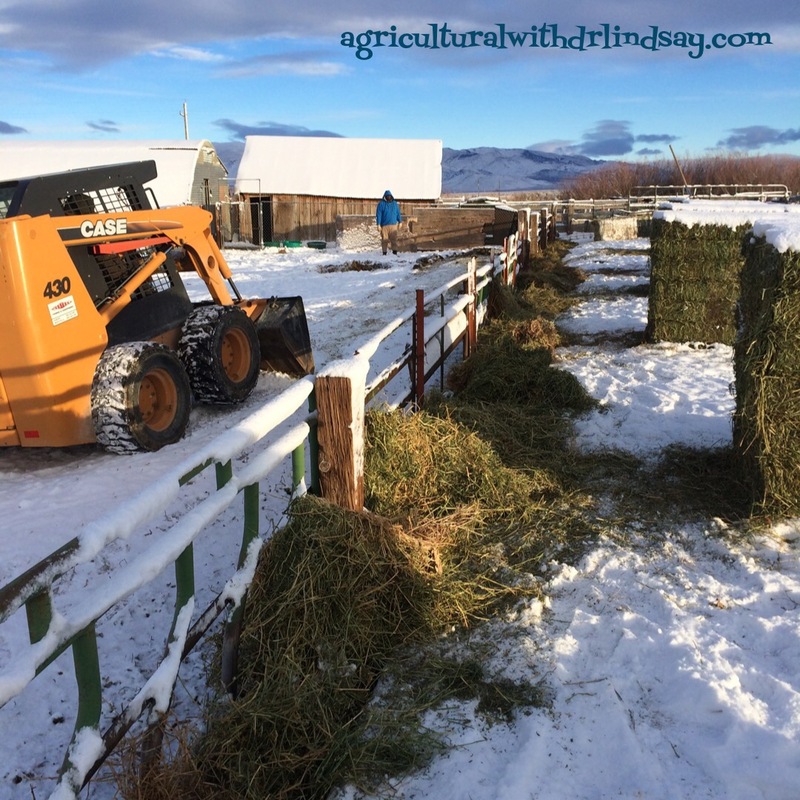 My parents are involved in the day-to-day tasks as the sheep ranchers, I get to help on weekends and when there are bigger tasks to do, like when we wean, tag, and worm the lambs. Today I want to talk about what happens in the first few hours and days of the lambs’ life. There are visual signs from the ewe when she is nearing lambing (I will go into that in another post), we keep a close eye on the ewes and check on them several times a day. Sometimes if we catch them early in the birthing process we will put them in their own private pen, and sometimes they have their lamb(s) in the bigger shed or outdoors, and we later move them into a private pen. We really try not to hover over them while they are birthing as it makes them nervous, and can delay the process. Instead we let them do their thing for about 30 minutes, then check on them, give them another 30 and check on them again. At this point if no progress is made we catch them and perform a pelvic exam to ensure the lamb is coming normally. A normal birth in the livestock world is both front feet and head coming first. Any other version of that usually results in us intervening. Also, depending on the age of the ewe and the size of the lamb she may need assistance having her lamb too. Unless there are complications we try to let her have the lamb on her own. Once the lamb has been born, the ewe’s natural instinct is to get up and start licking the lamb off. This is a bonding process, but more importantly this dries the lamb, which is essential for survival if they are born outside in cold temperatures. At this point, if we see the birth we check to make sure that the nasal passages of the lamb(s) are clear and free of the amniotic sack or any any other blockages. Almost immediately the lamb will try to start standing on wobbly legs to nurse. It is important that the lamb get the first milk (aka colostrum), which helps them get a good start on life. We watch closely to make sure they have figured out how to nurse. Sometimes they need a little help learning to latch on, and sometimes the ewe has so much milk that her teat is too big for the lamb to latch on, making it difficult for the lamb to nurse. Once the lamb gets older it has no problem keeping up with the ewe’s milk supply, but in the early days it can be challenging. Also in the first few hours we put iodine on the lamb’s navel, which helps decrease the chance of infection or illness. If the ewe is going to have another lamb, she will usually start birthing again shortly after licking the first one off. Sometimes however, she has a second one quickly and doesn’t have a chance to lick the first one off immediately. We hope that she comes back to clean both of them after the second one is born, if not we try to dry it off with an old towel. As mentioned before, if the ewe and her lamb(s) are not already in a separate pen, they get moved to one. 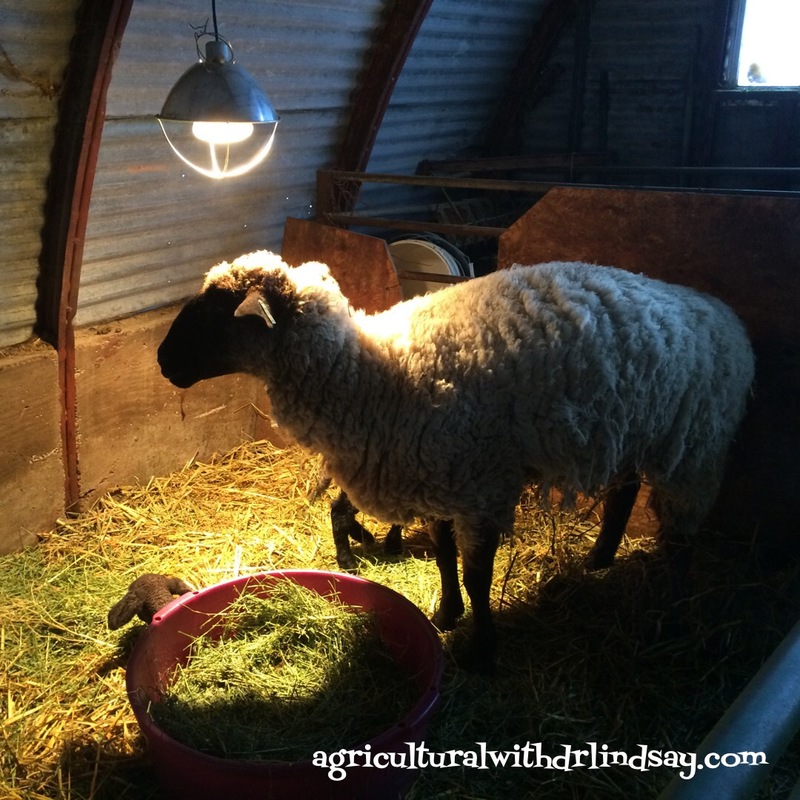 All pens have fresh straw, water for the ewe, and a heat lamp for the lamb. Also, when the ewe has finished lambing and taken care of her lambs (i.e. licked them off and let them nurse) we then provide her with hay, so can get her energy back up after the tough experience. Depending on weather and how the lamb is doing, they will stay in this pen for about three days. Before they are turned out with the rest of the flock, the ewe receives her spring vaccinations and a paint number is put on her back that matches the number on the lamb’s eartag. The lamb will be weighed, given a unique eartag (that matches the ewe’s back number and her eartag number), and an elastrator is put on the tail. An elastrator looks like a green rubber cheerio. Essentially it cuts off the blood supply to the tail (or if applicable, the testicles – but that elastrator doesn’t go on until they get a little bit older). This was the 45th ewe to lamb. This paint will wear off and not permanently damage the wool. The tools we need to work lambs and ewes. At this point the ewe and her lamb are ready to join the rest of the flock. It doesn’t take long before the lambs are running and playing with other lambs and then eating hay out of the lamb feeders. At our ranch, the ewes and lambs are locked up at night to help keep them safe from predators (i.e. coyotes). We are careful to make sure these new little babies are in this space every night, as they start to learn the routine. What didn’t I cover that you want to know more about? This past weekend I headed out to the ranch to help wean lambs. Weaning just means that they have become old enough and/or weigh enough to be able to flourish on their own, so they are separated from their mothers. For lambs, our rule of thumb is 60 days or 60 pounds, meaning they must be at least 60 days old to be weaned or weigh at least 60 pounds. The ewes (the mamas) can start getting thin at this stage because these bigger lambs are still nursing and the ewes have a hard time maintaining their body weight and condition with these big lambs nursing them. The lambs at this age and stage are also eating hay and can graze, so it is time for them to be weaned. Plus, in a few short weeks excited 4-H members will come and select the lambs they will raise and show this year. We sorted the lambs into two pens, one pen held lambs that met the 60/60 requirements and the other pen held the lambs that still need more time. Twenty-nine lambs were sorted into our wean pen and everyone else was let out to go eat their morning hay. Luckily we started early enough in the morning the ground was still frozen and we could get the horse trailer backed up to the shed. We have gotten so much moisture in the last month that there is mud that is at least ankle deep. Once the horse trailer was in place we let the lambs out of their pen and they ran right to the trailer and loaded (yay for this going so well). Now since we had them in a confined space (i.e. the horse trailer) we wormed them (they can get internal parasites from drinking out of running water sources, worming helps keep them healthy) and they got their Scrapie tags. Scrapie (pronounced scrape – e) is a fatal, degenerative disease of the central nervous system of sheep and goats, of which there is no cure. Other animal species can get a form of this prion misfolding disease too. In cattle it is bovine spongiform encephalopathy (BSE or “Mad Cow Disease”), in people it is variant Creutzfeldt-Jakob Disease (vCJD). The USDA (United States Department of Agriculture) has a national scrapie eradication program, and each state department of agriculture has a premise identification program. In the premises ID program, each animal rancher/farmer verifies what their address is and what species they raise. Before sheep (or goats) can leave where they were born they must be tagged with one of these tags, if there ever was a Scrapie outbreak, the animal could be traced back to its home ranch/farm. Fun fact – it is illegal to remove the Scrapie tag before an animal is harvested. That tag must remain in the animal’s ear for its entire life. Once each lamb had been wormed and tagged with the Scrapie tag, the lambs were taken to their new home. A pen near where they had always been. They will stay in this pen until they go to a new home with the 4-H members, until any replacement ewes are big and mature enough to rejoin the flock, or they are harvested for meat. 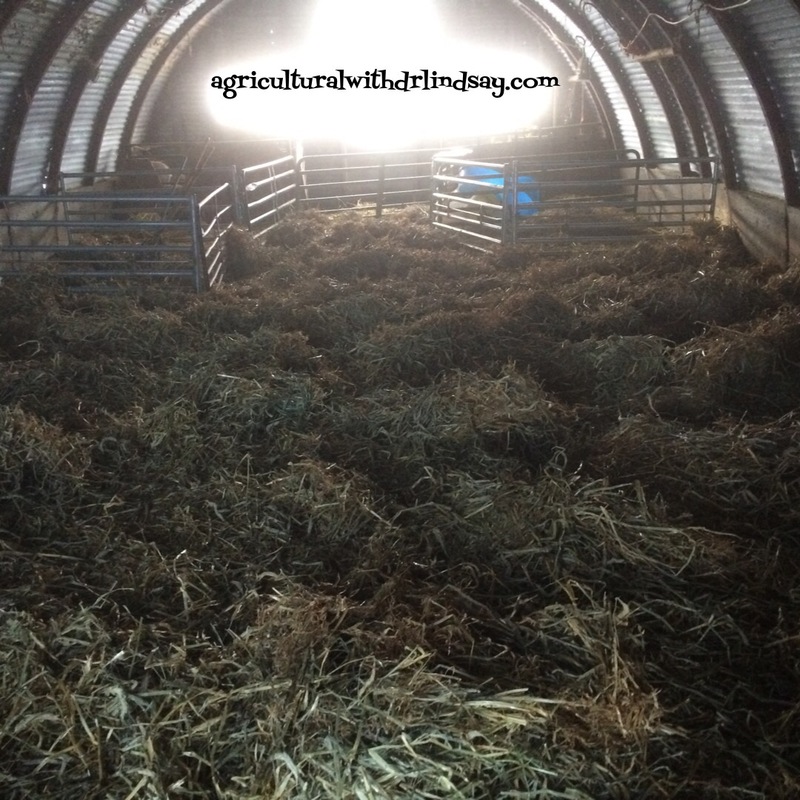 In this pen they have access to alfalfa hay, grain, and fresh clean water, as well as two sheds. It usually takes a couple of days for the lambs and ewes to recover from weaning. 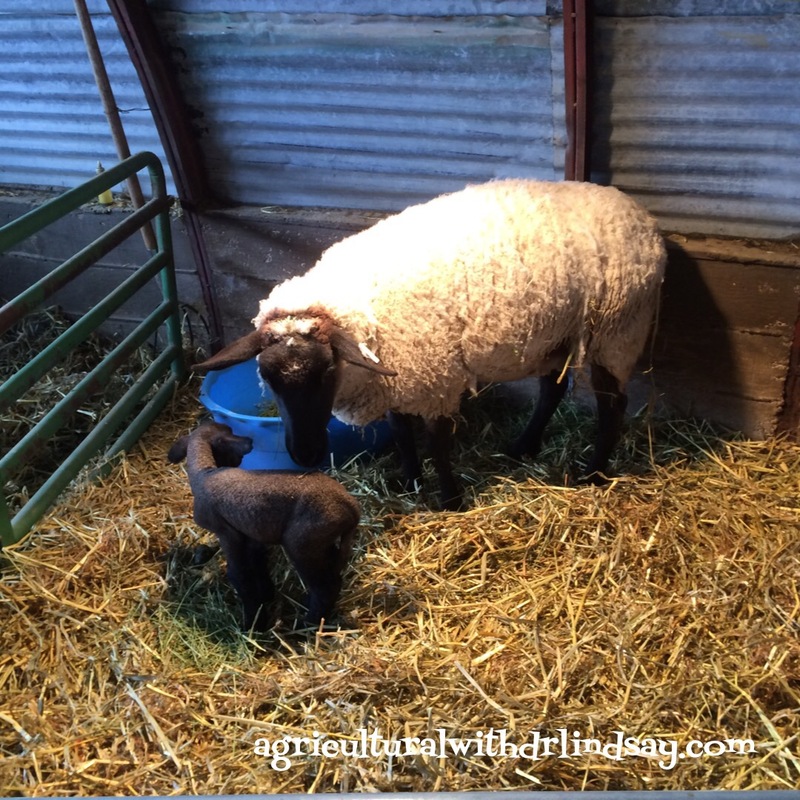 The lambs learn how to eat hay and grain out of feeders and the ewes have a chance to start putting some weight back on that they may have lost while nursing. If the ewes get too thin they have a hard time cycling and breeding again. Weaning lambs is a lot of work that requires all of us to get it done. But it is also rewarding because you can really see how well the lambs are doing and have pride in knowing that under your care they will reach their full potential. Essential oils: Can they reduce antibiotic use in livestock? If your social media pages are anything like mine they are filled with claims that something you eat, drink, or wrap yourself in has miracle and restorative properties. While these products may help you loose weight, look younger, and feel better, is there really really any truth to them? I recently saw a headline that said researchers have found that essential oils could help reduce antibiotics in poultry. My immediate thought… is this woo or is this true? MeatingPlace.com reported that Cargill researchers have found that essential oils can be a viable alternative to antibiotics to promote gut health in a poultry feeding program. It was found that certain essential oil compounds, particularly those derived from thyme, cinnamon, and oregano had the most comprehensive effect on overall gut health. Benefits included antimicrobial activity, modulation of immune response, antioxidant activity, improvement of nutrient digestibility, and stimulation of mucus production, the company said. Cargill indicated the essential oils were particularly efficient in conditions where intestinal infections such as Salmonellosis and Coccidiosis were present, and were most effective when combined with organic acids. In addition, combined results from 12 trials showed that birds given Cargill’s Promote Biacid Nucleus additive, which contains a mixture of seven essential oil compounds, in combination with an antibiotic-free diet, improved body weight gain by 2% and feed conversion by 1.5%, the company said. Cargill said it has been researching the use of non-medicated feed additives for several years as an alternative to antibiotic growth promoters. Since 2009, it has conducted a total of 77 trials on additives including essential oils, probiotics, yeast derivatives, and medium chain fatty acids. “Only essential oils have both a broad spectrum of activity against pathogens and a direct impact on digestive function,” said Stephanie Ladirat, global technology lead for gut health additives in Cargill’s animal nutrition business. It is interesting that this research has been going on for seven years, no doubt we will see/hear more about essential oils and natural medicine for animal agriculture in the future. Being the skeptic I am, I have decided to research these essential oils a little further to see what else I can find about their supposed claims to being an alternative to antibiotics. Stay tuned as I will do a follow up post after doing some research. Can essential oils be a viable alternative for antibiotics in poultry? ** Note: I am not endorsing essential oils or their use, I am just merely investigating uses in animal agriculture. Much of the U.S. has experienced some unusual and aggressive weather in the past week. At my family’s ranch we got about 5 inches of snow, followed by freezing temperatures. It has been a few years since temperatures have dipped down around zero! 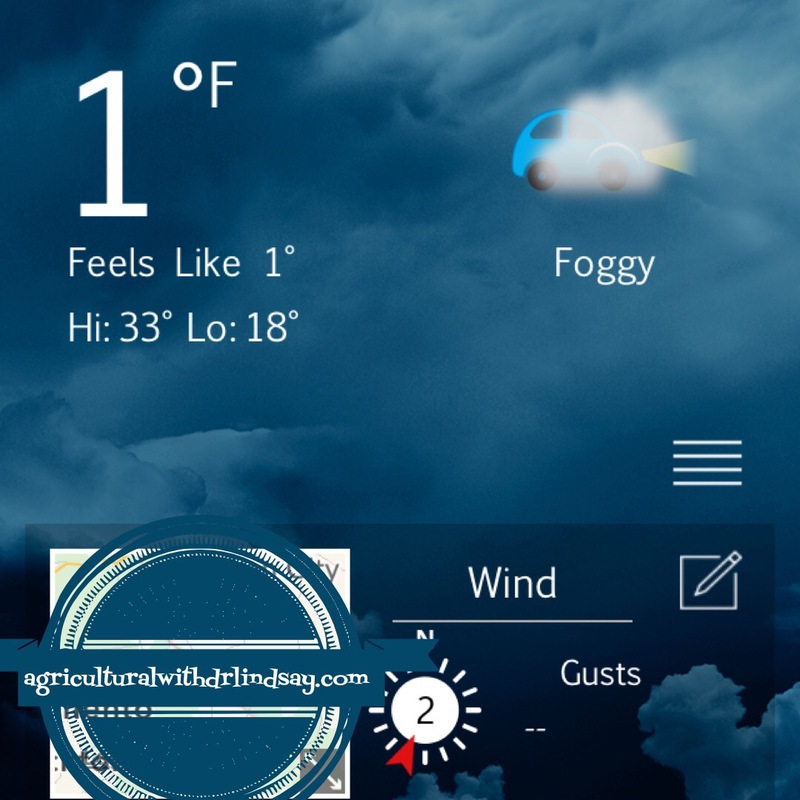 When it gets that cold, it can be hard on everything – people, animals, vehicles, equipment, etc. Drastic changes in weather and barometric pressure can also mean more baby animals may be born. Sure enough, my Mom’s ewes started lambing again. To ensure both mamas and babies remain healthy and warm during these extreme temperatures we do several things. First, the sheep shed receives fresh straw regularly to give all of the ewes and lambs a dry, warm place to lay. Next, when a ewe starts lambing she is given a separate pen with plenty of straw and a heat lamp for the lambs. In this pen she also receives hay and water regularly to ensure she is producing enough milk for her lamb(s). In these pens we can also keep a close eye on them to make sure everyone is healthy. The ewe and lamb(s) will stay in these pens until the lamb(s) are strong and healthy enough to be able to handle the elements or until the weather becomes a little more baby animal friendly. The ewe will also put off heat with her thick wool coat. During extreme cold weather events, if animals do not receive enough energy from their feed they can loose body condition, lactation may decrease, and they may struggle to stay warm and be comfortable. We ensure that all of the animals in our care continue to have access to plenty of fresh clean water, but also plenty (and extra) of feed. Luckily this extreme cold spell only lasted about 3 days, and our morning temperatures for now are back in the low 20s. Despite the increase in the morning temperature, the care of the animals remains a top priority for us and other livestock ranchers and farmers around the country. Once again another company has fallen victim to the “no antibiotics ever” marketing ploy. Just like you, me, our families, and our pets, food animals get sick. When they do, a diagnosis of illness is made and that animal receives quick medical attention, and probably an antibiotic. Cattle, poultry, pork (insert other animal protein sources here) farmers and ranchers closely follow antibiotic withdrawal dates, meaning there are NO antibiotics in your meat, milk, or eggs! Trust me, these products are regularly tested for residues. Once the animal has made a full recovery it’s protein is completely safe and wholesome to enter the food supply. Can you imagine a “no antibiotic ever” world where animal health declines and animals suffer (and die) from their illness because end markets like Subway won’t accept the meat if the animal has been treated for illness? As a 4th generation agriculturalist, I will not let any animal suffer or die under my watch just so a food company, such as Subway can make a few people who think this is a good idea happy. I am reblogging a post that Anne Burkholder just put out. Anne is a feedlot owner and cattle farmer, who raises and cares for a thousands of animals every year. Tuesday, Subway restaurants made the announcement that beginning in March 2016 it will serve chicken raised without antibiotics. Further, the company will source turkey, pork and beef in the same manner within a 10 year period. A spokesman for Subway stated that company’s goal is “eliminating antibiotics from all of its meat supplies within 10 years”. There are two different things going on in the above statement that are being blended into a mass of dramatic confusion. I want to take a moment to clarify so that everyone can be educated food purchasers. Dr. Brad Jones, a veterinarian with the University of Nebraska and Great Plains Veterinary Educational Center talks about the decision-making process regarding antibiotic use in cattle and pigs, including the diagnosis of illnesses, treatment and antibiotic use considerations, and how animals are tracked from antibiotic administration to harvest. This video by North American Meat Institute (NAMI) is part of the “Glass Walls” series which are designed to offer a behind the scenes tours of meat harvest facilities, how meat products are made, and more. You can watch more of the Glass Walls videos here. Cows: What do cows involved in research look like? Recently, Karl, the cow/calf herd manager at the research station where I am based, asked if I wanted to go look at the calves. I jumped on the opportunity, as it had been a few months since I had seen them, I also grabbed an office support staff member who missed the baby calf viewing. Karl has this herd split into two groups, as they are easier to manage. Karl also explained that these cows have two roles, they are part research herd and part teaching herd. 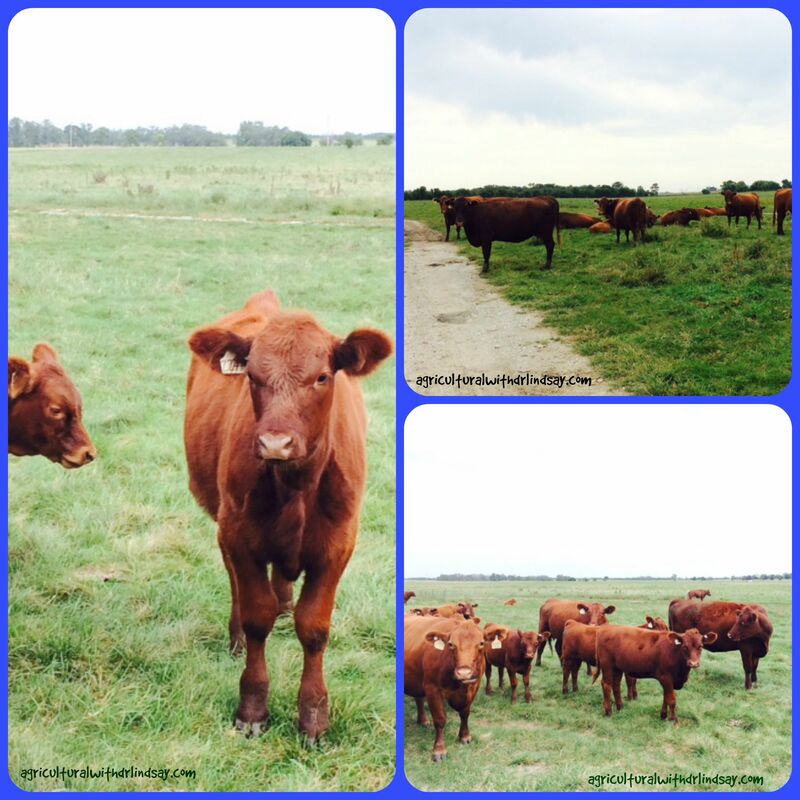 The calves are looking great – almost time for weaning. As part of the physiology research herd, these cows may have blood drawn to look at progesterone levels, they may have different breeding synchronization methods, or they may be fed different feed rations to see how the fetus responds, and later how that calf performs in life. Fun fact: cows that experience stress (i.e. diet limitations) while pregnant, have calves that generally do not perform as well as calves born to cows with minimal stress. By using cows as a model, we now know the same holds true for humans! To read more about cattle fetal programming, visit here, here, and here. 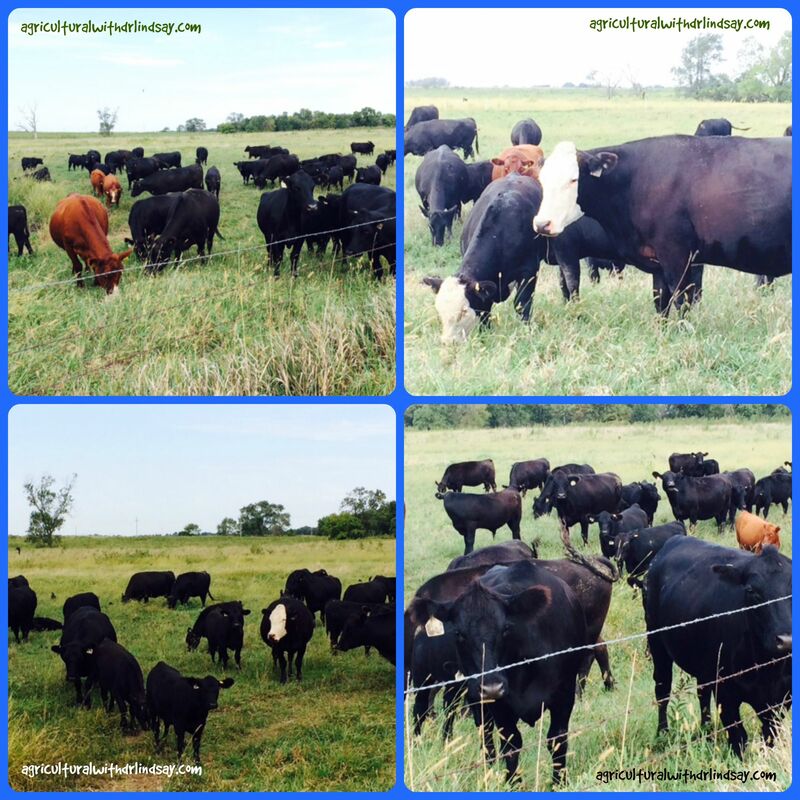 Did you know cattle also have a 9 month gestation period just like humans? The cows and calves are all fleshy and look great! As part of the teaching herd, University of Nebraska-Lincoln (UNL) graduate students learn how to collect blood, help with various cattle tasks as needed, and may assist with surgeries if and when necessary. It is a very hands-on, real world approach. ALL animals involved in research and the people who work directly with them, must be current on their IACUC (Institutional Animal Care and Use Committee) training, and all facilities are inspected twice a year to ensure they are safe for both animal and human. Read more about IACUC here. Cow/calf pairs… (Left): A big bull calf is nursing his mother. (Right): A mama cow is checking out the denim piece over the calf’s eye. The calf got pinkeye. Once the eye has been treated the patch helps protect it from sun, dirt, flies, or other irritants. The patch will naturally fall off and is hopefully healed under the patch. As you can see, these research cows are very healthy, have plentiful amounts of grass in their pastures, and appear to be happy. Karl and the UNL students ensure they are well taken care of daily! 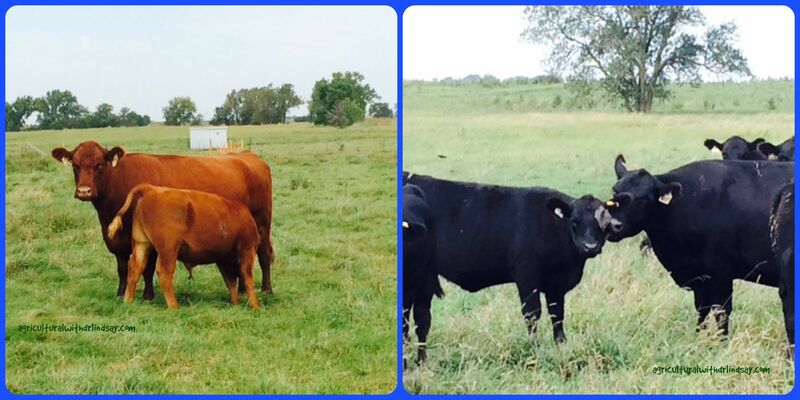 The research cows look just like any other cow that you may see in pastures! The cows also play a role in making advancements in human health and medicine, how cool is that! ?